Seat(s): Wide and leathery, the seats in this United First Class cabin aboard a 737-800 are about average for this plane and our bulkhead seats in row 1 come with a pretty reasonable amount of legroom. If you’re better than 6 foot you might find the wall to be restrictive but we’ve seen them much closer. Only 1B has a small cutout at the base of the wall for a little extra extension. Center consoles are average when it comes to width and sport small thigh-level cubbies for storing small items and a tiny pull-out extenuation at the front for your extra beverages. Tray tables are in your armrest and may eat up a tiny bit of seat width but not much. 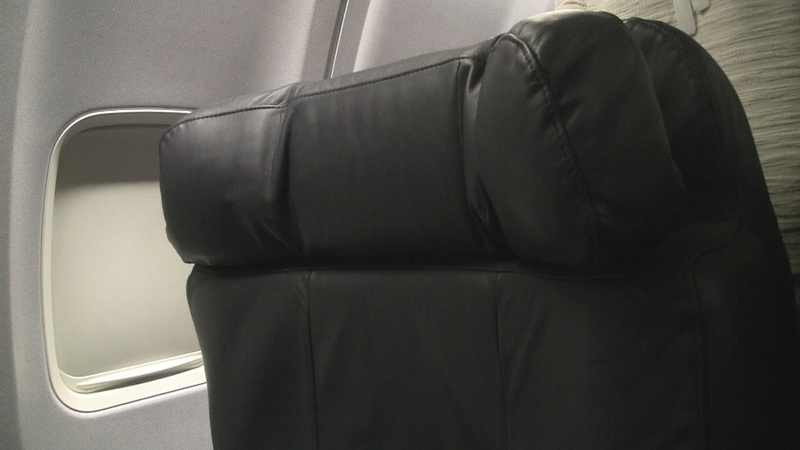 Big and cushy, we were fine with this domestic first seat on this daytime transcon. Tech/Connectivity/Entertainment: When it’s working, we like that there are several channels of free DirecTV and a few movies on loop. At review time, United was still working on building wi-fi into it’s fleet so tv gives you something to do after your gadgets run out of power. Power ports are built into the front of the center console but were out of service on our flight so after the phone and laptop were gone it was all TV or Hemispheres magazine for us. If all the tech aboard this United 737-800 is working, you’ll sleep better that night knowing that you ponied up your well deserved miles or cash for the upgrade. Food: Hardly a vegan, I felt bad that this animal gave it’s life to be a hard to eat hunk of airline food. From now on I promise to be a more selective meat-eater and go for veggie pasta dishes instead. I didn’t like the beef. If anything saved the main course, it was the potatoes and a reasonably fresh side salad. Then there was an ice cream sundae with my choice of toppings. I gladly accepted this as an apology for broken power ports, intermittent TV and chewy beef…but not for Hemispheres magazine. Service: Being up front seems to mean a lot when flying United. Our recent domestic flights have shown us service that’s probably still 3rd (among major US airlines) on our list for first class domestic hops, but far better than the massive economy class drop-off that happens when you wander into Economyville. 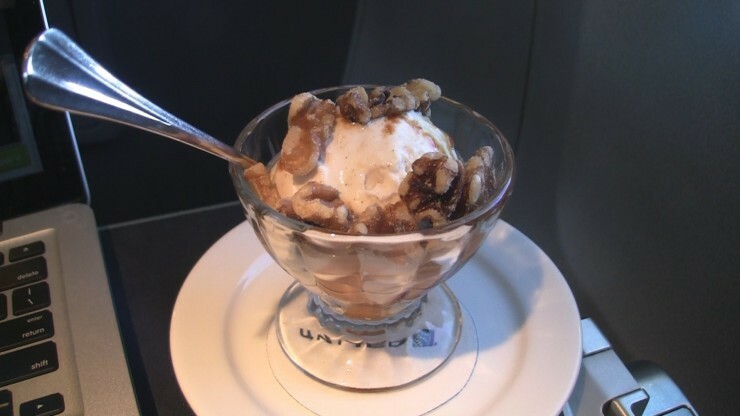 This was one of our better recent experiences inside a domestic United First Class cabin. Most appreciated is the warning from the flight attendant that their decaf coffee was instant. I’d been drinking a lot of Starbucks ViA packets so I figured it’d be fine. I figured wrong. How we got em’: Space-available upgrades can be offered in the days leading up to your United flight and at check-in for an additional fee. Alternately premium cabins can be booked using United MileagePlus miles. What app was that you were using on your phone? Definitely looks like that ice cream saved them a star. Any chance of a future flight on AA’s new a319? Have a trip in a few weeks and fingers crossed to get the upgrades. always enjoy your clips and text reviews! !